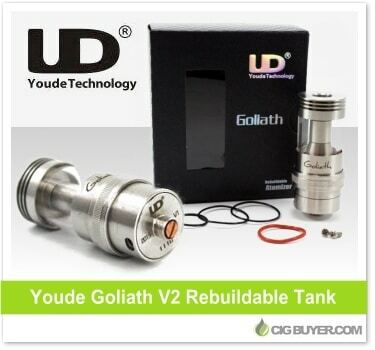 The Youde Goliath V2 RTA is the upgraded version of the limited edition V1 Goliath Rebuildable Tank. V2 has a new and improved build deck that allows for even more flexibility, easier to adjust liquid control and smoother adjustable airflow. Like the original there’s no need to drain the tank to access the coil, and the Goliath 2 RTA tank will also accept Youde’s new pre-built ceramic ROCC coil heads.